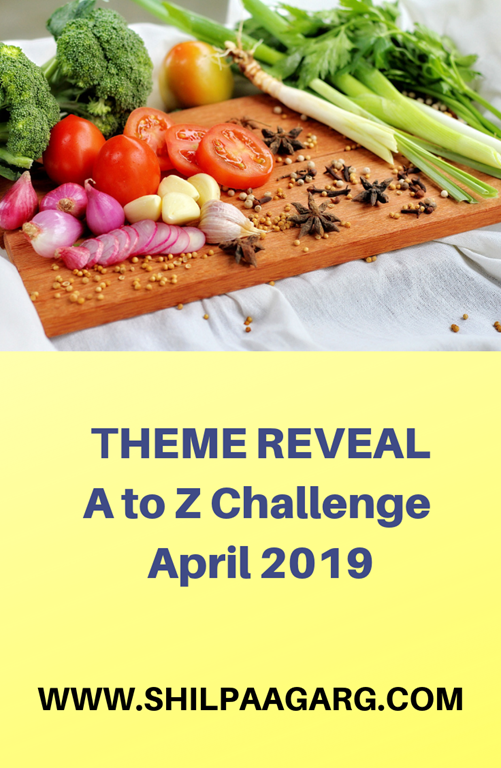 Theme Reveal - A to Z April 2019 Challenge #AtoZChallenge - A Rose Is A Rose Is A Rose! April is coming!! Yes, it’s that time of the year, when bloggers from all over the world don their creative hats and blog all through April except Sundays. I have been participating in this annual mega blogging challenge since 2013 and I have loved being a part of it . Creativity : A challenge like this helps to spark your creativity and gets the creative juices flowing. It helps to explore and connect with your writing voice. When you write regularly, you hear your voice more clearly. Connect : You get to connect with like minded bloggers from all over the world and get to read them on such diverse subjects. Courage : Writing and reading everyday needs courage and consistency. And to ace this challenge, you need to have oodles of both. Content : Participating in a challenge like A to Z helps in generating a stronger online visibility and builds content too. Contentment: The sense of accomplishment on completing a daily creative practice is a real thrill. I am looking forward to all these 5 Cs this April. I will be participating in this challenge for the 7th consecutive time. My Theme for the A to Z Challenge 2019 is : Food Talks. Yes, this April, I am going to talk all about food and nothing else. You know, food is our common ground, a universal experience. We are a family of foodies. The husband is a magician in the kitchen and is a chef by passion, the kid aspires to cook and I am serious about eating good food. As they say, you can’t just eat good food. You’ve got to talk about it too. And you’ve got to talk about it to somebody who understands that kind of food. And that’s YOU!! So this April, I am going to talk all about food, our experiences, experiments, basics, tips, ideas, hacks, trends and much more, yes, a lot of food for thought! So, pull up a chair. Take a taste. Come join us, this April. Life is so endlessly delicious. Theme Reveal closes on March 28, 2019. Check all the details at the A to Z Official Blog here. Bravo!!! Yes, as you said, I’m pleasantly surprised. But you know for sure that I’d be dropping by your blog every single day. Happy AtoZ! Wow! It’s here already! I’d thought of an idea for this year right away after last year’s challenge but was never able to put it all together efficiently enough to be ready for this year. Mine was about food, also! Perhaps I’ll save it for next year and work on it a little bit at a time (it would take time and pictures). Now I have to think hard and fast to see if I can come up with something worthy of participation before the month’s upon me. Well I had definitely shelved the idea this time round Shilpa – but your post is making me rethink ~ mmmmm mmmmmm maybe! Please do participate, Susan. I love reading your thoughtful and insightful posts. And truly appreciate your support too! Great! I am not participating this time. But I will be here to read your awesome posts this April! All the best, Shilpa! Awesome Shipa. This is my first time in A2z so wasnt sure how good idea it would be to write all food related blogs. Looking forward to yours. That’s what a theme is all about…. ie you write about a subject/category. As it is food is a very vast topic. I have written without a theme and on a theme from A to Z. Both are challenging in their own way. Writing on a random new topic almost every day or writing on a planned subject (which could be restrictive) from A to Z has its thrills and chills. 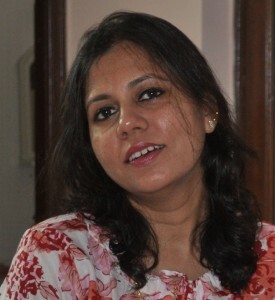 Looking forward to read your posts, this April, Vartika. Cheers! I am already hungry for your posts, Shilpa! You are going to rock the challenge, yet again! AtoZ is marked in bold on my notice board but your post just gave me a reality check. Interesting theme. Looking forward to the “food for thought” throughout April. Are you participating in this challenge, Deepali? I couldnt see your theme reveal post on your blog. Thanks for your support, appreciate it! This is absolutely my kind of theme, Shilpa. Food is wonderful. I am doing something similar. Good luck to you. You will obviously rock it! Food? Now try stopping me from coming to your blog every day 😀 All the best Shilpa. Oh, I love this theme, Shilp! And, I love food! So, I will be here every day next month! Looking forward for your foodie tales.. Wish you the very best, my dear! Great, looking forward to a lot of delicious stuff from you. Thank you, Meena. I am looking forward to your Movies and Memories posts too. Cheers! Thanks for introducing me to the A to Z challenge. I haven’t heard of this before! I really liked your reasons for doing the A-Z. All the best for the challenge. See you in April. Thanks a lot, Nilanjana. Yes, see you in April. Cheers! As a chef by trade, I’m sure I’ll find your theme extra tasty this year! A for your C’s, I totally Concur. Wow! You are a chef, Keith!! How cool is that!! Looking forward to your support this year as well and looking forward to your stories about children, for children. Cheers! I will not be doing A2Z this year but all the very best to you. Food for thought – sounds like an interesting theme. Looking forward to catch up with you through this month. That’s a great theme, Shilpa! Will stop by and read as and when even though I’ll be travelling through the first half of April. All the best for April. I know you’ll ace it as you always do. I’ve missed your posts. So happy to see this and like always, I am going to wait eagerly for the challenge to begin. 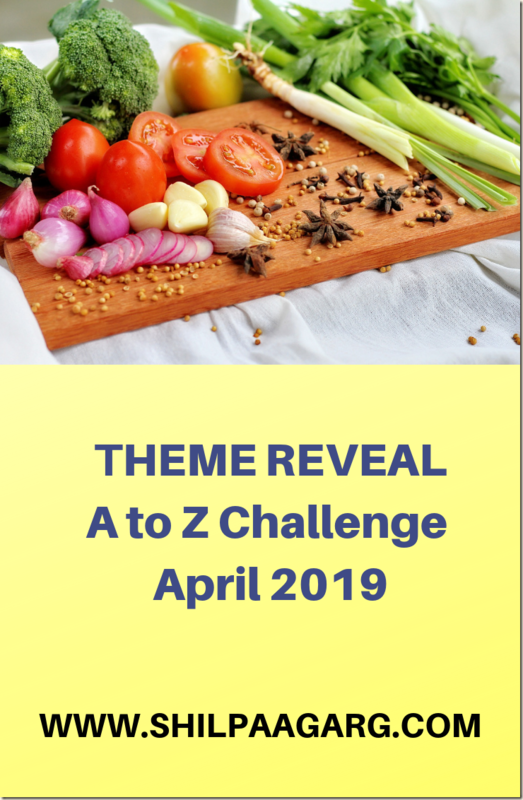 I am really looking forward to your Blogathon in April and being a foodie , I definitely love your theme for this challenge too. I will surely be on the lookout for your posts. Great theme and promising posts. Good luck to you! HI Shilpa!!! So nice to see you again on the challenge! Wow!! SEven years! You’re a serious veteran. Here’s to another great April of blogging dangerously! I’m completely loving the themes this year. Food is just perfect for a theme given your baking skills. This is going to be fun. I love the buzz of the A to Z Challenge and will joining in solely in the capacity of a reader. Good luck and I’ll be around. Great theme Shipa, and I am sure you will share great stuff this year too, like last year. all the best and wish me the same. feeling nervous, hoping to complete it. You will ace it, Surbhi. It’s the “mandatory-April feeling”, which we all go through. 😀 All the very best to you too. See you in April. Cheers. Super! And I hope you’ll share your banana walnut cake recipe in one of those posts! Just food for thought, you know! Food is one which binds us all together. Good to know your theme, expecting lots of creative writing from your end. All the best for your challenge. I will surely be reading each and every post since I am a foodie and would love to see your journey. Great! Look forward to reading your posts. You convinced me with that post. It’s good to see you back for another round of A to Z and to read such a great pitch for trying the Challenge. Thank you, Arlee. Truly appreciate your efforts in hosting this amazing challenge. Looking forward to your posts too. Cheers! Even I want to keep sometime to read and write everyday. Let me see haw far I will be successful. A theme after my heart. This will be the second year I’m giving this challenge a miss and it is largely because of space issues with my server. I still have to clean up. It’s taking longer than I expected because I have to do it file by file. Look forward to reading your posts and wish you luck! Hope your blog issues get sorted soon, Sunita. Truly appreciate your support and warm wishes. You will be missed… I remember your informative and interesting posts on Textiles of India. It’s just my 2nd round. The debut was last year. I will be putting up the reveal theme in a few days. Awesome! I’m looking forward to reading your delicious posts, Shilpa. I opted to participate in the challenge suddenly on a whim today. Hoping to read some great blog posts through April! Wow, this is your 7th year of A2Z challenge, I need to take a lot of tips from you on how to survive such a grueling challenge. Will be looking forward to reading your posts. What a great journey you had….really looking forward to your posts…all the best!